Andy Hartzell’s Fox Bunny Funny is the tale of a little misfit fox child. He knows he’s different. He’s ashamed. He struggles with it, confusing and worrying his parents until they send him off to the fox cub scouts to be conditioned and cultivated into a fox adolescent of the more typical sort. On his own, his well-being, maybe even survival, depend on his fitting-in. And he prevails, faking it and fending off his true nature in the name of conformity. This is no kind of victory, though, with our protagonist ultimately betraying himself and falling into a joyless life, contrary to his nature and banal in its evils. And so it cannot end here. 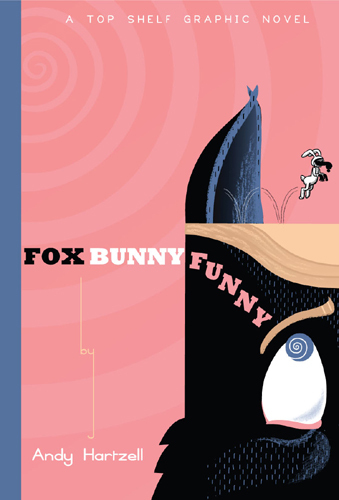 While cutely drawn and wordlessly told, Fox Bunny Funny is not a light read. There are happy and funny moments, and there’s comfort in its spirit, but this is a work of philosophy. With its allusions to karma and samsara, Hartzell reveals himself as, at least, a student of Eastern thought. And while it all may be an illusion and a matter of perception, suffering can certainly feel undeniably real.